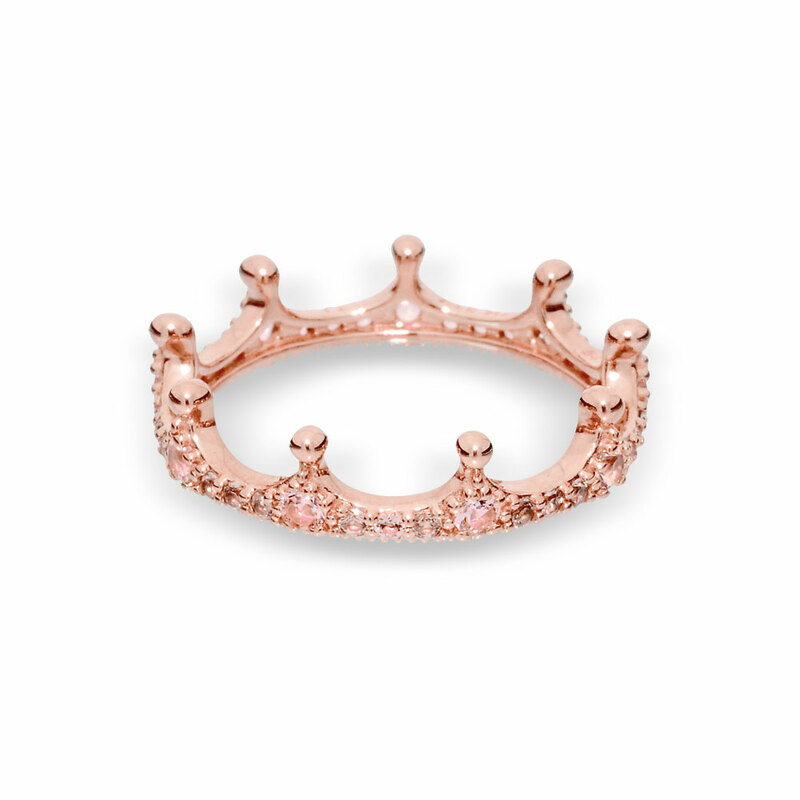 Dress your fingers in a regal accessory with this crown-inspired PANDORA Rose ring. Created with a unique blend of metals, its radiant hue is complimented by gleaming orchid pink and blush pink crystals. Stack it with crowns in our other stunning metals for a royal flush of style. Available online and in-store from size 44 to 64. PANDORA Rose Pink Enchanted Crown Ring is rated 3.9 out of 5 by 35. Rated 3 out of 5 by azx01 from Pink Enchanted Crown This was such a cute ring gifted by my cousin. However, after wearing it for about 2 months most of the gems have turned green. Tried to clean it using a brush, toothpaste and water but it doesn’t make a difference. My other 2 rings from Pandora never had a problem with the crystals changing color. Is there any solution to fix this? Rated 3 out of 5 by riley23 from great ring for a few months.. my boyfriend got me this ring for my birthday back in august, 2 months later some of the gems are turning this blue/green. i don’t know why- i have never taken a shower or gone swimming with this ring on. Rated 1 out of 5 by shannon47 from Very Disapointing I received this for my birthday in May and in 3 months the jewels began to turn a dark green color. I had thought this was my fault and put it in jewelry cleaner but the black color would not come out. The ring looks disgusting and I have not worn it for months until recently I looked at the reviews and saw people said that their rings turned the same dark green. I saw some issues with this on the rose gold princess ring. Very disappointed because when I first got it it was beautiful- but now I can't wear it. Rated 1 out of 5 by torrr7 from DO NOT BUY THIS RING. I received this as a gift and LOVED it, but in 2 months the jewels began to turn an ugly green color. I have it stacked with two other Pandora rings and they are perfectly fine. I had it replaced and less than a month later the new one did the same thing. I no longer wear it and I’m extremely disappointed because I loved it and got a ton of complements on it when I did wear it. Do not purchase this ring. It is a total waste of money.